How was road season? I assume you’re just wrapping up. Road season was good. I started pretty early. I raced cross nationals in the middle of January. Then by the end of February I was back on the road. I started with the Valley of the Sun race in Arizona. I eased into it and I was going really good by Joe Martin. I got 3rd in the TT and finished top-10 in every stage and fourth overall. But then in the next week at Gila I had a really bad crash. Probably my first legitimate concussion. I landed on my back and head so that set me back for a while. But I recovered and was going strong again by Cascade. I raced well there. The result doesn’t show that, but it’s because I wasn’t racing for myself. I spent three days in the green jersey. I got 9th in the TT after taking a 40 minute solo flyer the day before. I ended with Cascade, which is really nice. I have not been able to end my season that early and start focusing on cross. It was really great being able to work for Amber Neben. She actually had a crash at Joe Martin the week before my crash. She ended up with a small fracture that took her out for a while. So she wasn’t as strong as she can be at Cascade, but she still finished second in the GC. It was kind of amazing for what a tough season she’s had. I’m always amazed and slightly horrified by the types of injuries pro cyclists will race with or just push through. When I crashed at the Gila I raced the TT the next day. My husband was in the follow car behind me and he said I wasn’t even riding in a straight line. He could tell I had no power. My cadence was all over the place. After the TT I couldn’t even move and that’s when the team pulled me out of the race. We didn’t realize I was concussed until then. I’d passed my concussion test the day before. Jumping back, how’d you get your start in bike racing? It was right after I did that Iron Man that I decided to just focus on bike racing. It was 2009 and I joined a local club as a Cat 4. I raced road, track, and cyclocross that year. The only thing I didn’t try was mountain. I had good success in every discipline I did and was able to upgrade quickly and win races. In part I got by because I was just really strong. I don’t feel like I really learned how to race my bike until I signed my first pro contract. I didn’t learn any team tactics. I didn’t learn how to be a smart bike racer. But you get up to the pro ranks and everybody’s strong. You have to be strong and smart. I remember my first season as a pro I was getting beaten by people who on paper maybe weren’t as fast as me. But they were smarter bike racers. Jessica Cutler at the Energiewacht Tour. How did you make that transition to pro racing? I was racing locally in 2012 for a team I started with friends called the Spokeswomen. I went down to Sea Otter Classic and had a really good race. I ended up 3rd in the GC. I was waiting for the final podium and Primal Wear’s team captain came up to me backstage and asked for my phone number. The next day the team director called and asked if I would guest ride for them at the Tour of the Gila six days later. They flew me down and I was able to help Emily Kachorek with her 6th place in the GC. They offered me a contract after that and I raced the remainder of the year with them. Then the team folded, so I moved over to Vanderkitten in 2013. Now I’m with FCS/Zngine. The team’s been around for a while, but this is their first year of racing a full, supported calendar. The team this year was really built around Amber. But we’ve also got some good sprinters on the team who’ve gotten some crit results. The team is based out of Texas. We’re largely supported by Orbea, FSA, and a startup company called Zngine that’s based in Dallas. Tell me about balancing your law career and your racing career. I do mostly family law. I work 15-20 hours a week. When you’re a lawyer you don’t need to bill that much to be able to squeak by. I’m not going to lie, if it wasn’t for the support of my family and husband, there’s no I’d be able to do what I’m doing. I would have to work full time. Of course, I side hustle a little. I coach through Cycle University. I teach a lot of their classes and have five individual coaching clients. I am able to train, but I have to really make the time for it. And with coaching and classes at Cycle U I have to be really honest with myself about what I have time for. I have a tendency to schedule every day down to the minute, which never works out. One thing goes wrong and all of a sudden I’m late for everything. I’m able to do a lot of work at night, work at home. A lot of times I get my training done in the middle of the day. Especially in winter I can go out at 9 in the morning and ride for four or five hours. I have a work phone that I always keep with me. Even when I’m out on a ride I’ll try to stop at least once to check email in case there are emergencies. It’s hard. It’s a constant juggling act. But there’s just no way I could get away with not working. Is it possible for pro women in the United States to support themselves on bike racing alone? No. It’s just not possible. Almost everyone–we’re talking about the top women in the US–almost all of us work at least a little bit. Look at Allison Powers, the first woman in US history to hold the national road, criterium, and time trial titles. She still works; she coaches. I don’t know Allison or her salary or financial situation, but the fact of the matter is, she’s working. If you’re a really good criterium racer and you can go podium at every USA Crit then you might be able to make enough prize money to make $40,000 a year between that and your salary. It’s really hard. You almost always need to have outside support. I think it’s the reason the women’s peloton is a lot older in the US than in other countries. And much more highly educated. Almost every woman I know that I race against who’s over 22 has at least a bachelors degree. Tons of us have advanced degrees. There a few with doctoral degrees. Nicky Wangsgard who retired a few years ago, she’s a tenured professor. She was up for tenure her last year as a pro. It seems like things are slowly getting better in women’s cycling with baby steps like La Course and others. But obviously there’s still a long way to go. How do things get better? How do we get to where professional women athletes in the US can be full time professional athletes? I don’t know. I mean, I look to tennis a lot of times. That is one sport I know of with a lot more gender parity than most sports. It’s in part because of people like Billy Jean King and the Williams sisters have really pushed for equal prize money and equal coverage. So that needs to happen. One thing about tennis is all of the major grand slams, the men’s and women’s events are run back to back. In those tournaments the women’s finals are usually on Saturday and men’s on Sunday, so it’s not like “oh come for the preview.” I like the idea of running cycling events concurrently, but I still think it’s problematic. 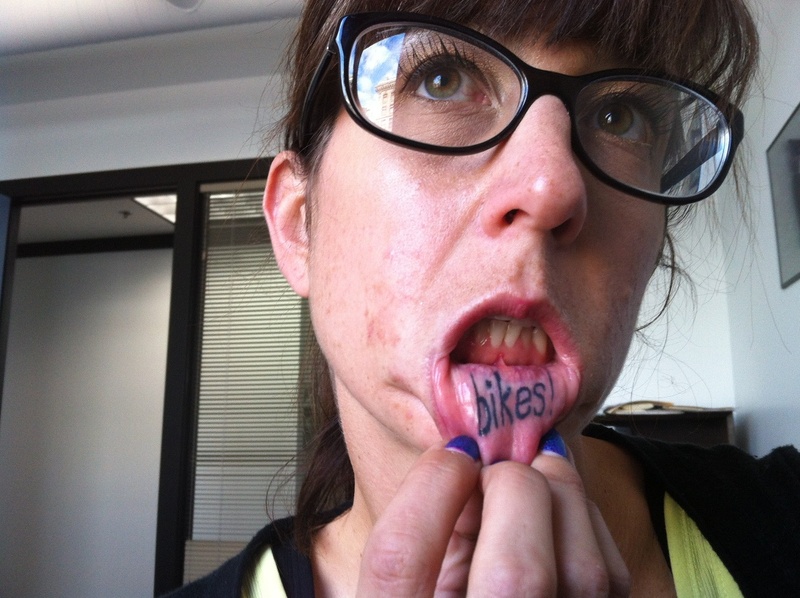 It’s asking women’s cycling to still be dependent on men’s cycling. But that’s where it needs to start. We need to start with concurrent events. Having women’s teams that are part of men’s teams. Like UHC and Optum did this year. But I hope that by running the events concurrently and having women share the spotlight with men, eventually we can build to where women’s events stand alone. It’s a tough conundrum because a lot of people don’t even realize that women race. I remember when Kathryn Bertine started pushing for Le Tour Entier, people legitimately didn’t get that women were asking for a women’s race, not asking to race with the men. There was all this backlash saying “well, women aren’t going to be able to keep up with the men.” And it’s like, we’re not asking to race with men. People didn’t even understand that women could have their own event. Not that the women’s peloton in Europe is some bastion of progressive gender politics, but it does seem like there are at least slightly more women who are able to race full time and supported. Given that women in the US have to work other jobs in order to afford to compete, there’s this built in hurdle that will keep Americans women from competing at the European level. It’s true. And that goes back to the age of the women. I’ve only been to Europe once. But when I was looking at start lists for the UCI races, the US women’s team was the oldest team there by 5-8 years. It’s because those other teams have junior development. And we don’t have that for women in the US. You go to junior nationals and the fields are really small. There are so many women who come into it when they’re my age. I signed my first pro contract at 32. Even if there’s not the salaries and the prize money is kind of terrible, at least there’s development. In the US there’s been a big push for prize money parity and that’s actually been happening. Philly had equal prize money this year. A lot of races, at least for the top 10, are equal money. That doesn’t happen as often in Europe. But it doesn’t matter if there’s no junior development. It doesn’t matter if we’re not starting women off at young age to go to Europe and be competitive. When I was in Holland there was a junior women’s stage race and there were 100 girls under 18 doing this race. They knew how to go back to the cars, to ride in the caravan, to echelon. We don’t have that here and it’s a shame. You’d never get 100 junior women in a stage race in the US. Is there anything resembling junior women’s development in America? I think Washington’s been great. Huge props to Erik Anderson for putting on the NW Juniors Stage Race. They kids coming from all over. There are people who are really pushing for it. 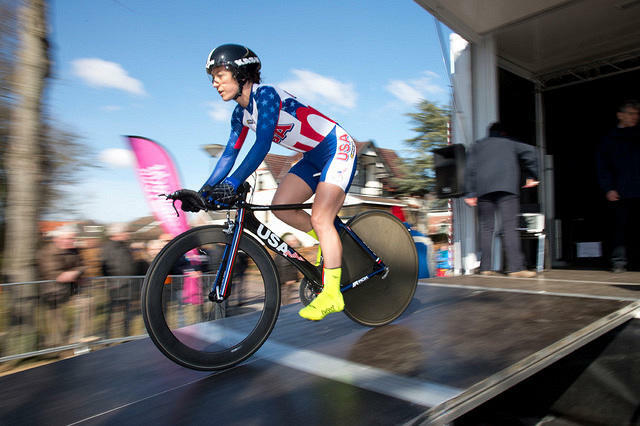 There’s also these talent ID camps that USA Cycling puts on and they’re great. But it’s just not on par with Europe. I don’t know what they do in Europe or how they get all those teams. One thing I noticed with those junior girls in Holland was more than half of them were on their national team. We don’t have a national team for junior women in the US. We have a junior men’s program, U23 men’s program. There are three men’s national teams, one women’s. 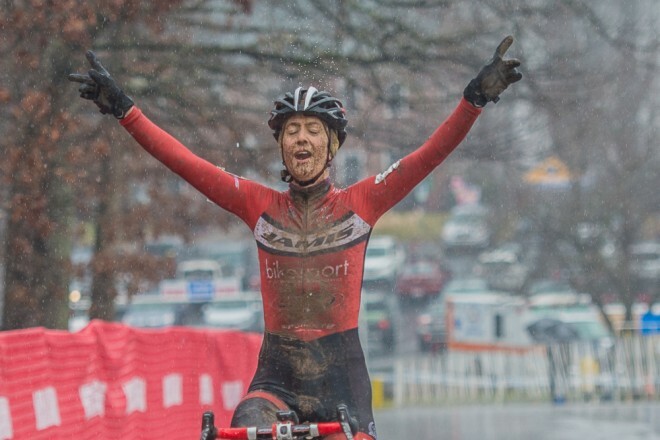 Jessica Cutler notching a win in North Carolina. Do you feel like there is some semblance a shift where there are women getting into racing earlier? There are some young up and coming pro women. I think it’s starting to happen, but it’s hard for me to say. I’ve only been part of cycling at this level for three years. But you’ve got some great young riders. Coryn Rivera and Ruth Winder on UHC. They’re 20, 21 years old. You’ve got some young women who are coming up and doing really well. I just don’t think there is enough individualized support for that age group. Not just to get them into it, but keep them in the sport. I see a lot of junior women get discouraged and drop out by the time they’re 18. That’s frustrating to see. Looking ahead, do you have any big goals for cyclocross season? I do. Last year I got third at single speed nationals. I don’t know if I can beat Mo Bruno Roy, she’s going to make it really hard, but I’m going to try. I really want to get that title. But obviously I can’t just focus on single speed. I wish I could, but it’s not a UCI event. I’ve got a great schedule planned out. I’ll start with CrossVegas, then go to Baltimore for Charm City Cross. I have a sister who just moved there so she’ll race the cat 3s, I’ll race elites, we can pit for each other. I’ll do a couple of east coast trips where I fly out, do one race weekend, stay for the week, then do another race weekend. I’m also doing a midwest trip where I’ll do the Cincy C3s and the PanAms. And then, later season another east coast trip for Supercross Cup which is literally across the road from my sponsor Jamis. Then there are some great races called Bay State outside of Boston. Then cross nationals. My goals are to keep getting better. I’ve been mountain biking a ton. Since Cascade I’ve been on my road bike maybe three times. Other than that it’s just been mountain and cross bikes. My downfall in cross has always been technical skills. I’m hoping that doing a lot of mountain biking will really help me put together that last piece of being a good cross racer. Of course it’d be really cool to win another UCI race. I don’t know if I will, but I’m certainly going to try. 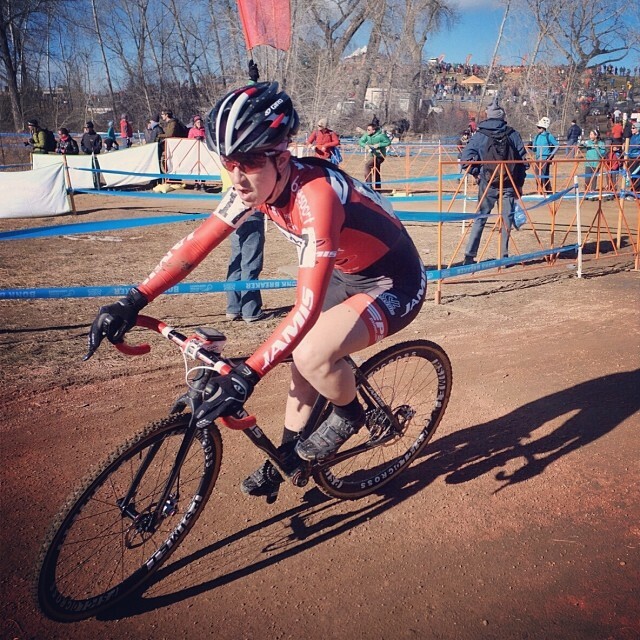 This entry was posted in Cyclocross, Interviews, Racing and tagged fcs cycling, gender parity, jamis, jessica cutler, pro womens cycling, vegan bike racers, women and cycling, zngine. Bookmark the permalink.